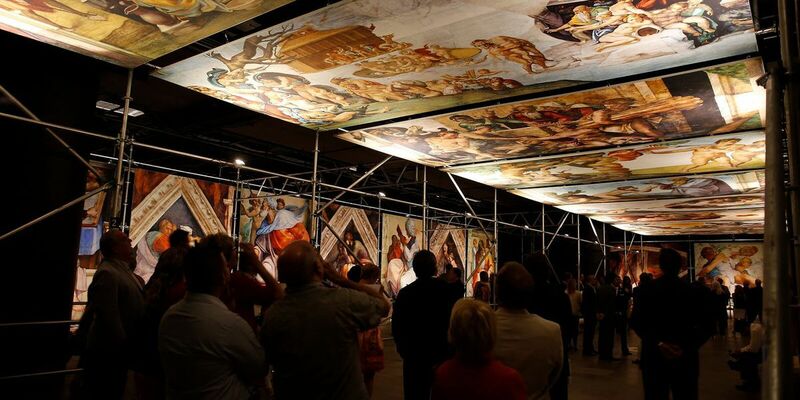 DALLAS, TX (KSWO)– For the first time in America, Michelangelo's Sistine Chapel: The Exhibition will have its U.S. premiere on September 30, 2016 at the State Fair of Texas in Dallas. This unique exhibition recreates one of the world's greatest artistic achievements, Michelangelo's renowned ceiling frescoes from the Vatican's Sistine Chapel, reproduced photographically and artfully displayed in their original size. This innovative interpretation of the timeless masterpieces can be viewed up close, including The Creation of Adam and The Last Judgment. Martin Biallas is the famed original creator of the award-winning "Titanic" and "Star Trek" exhibitions and many other successful traveling exhibitions worldwide. To produce Michelangelo's Sistine Chapel – The Exhibition, Biallas teamed with Erich Lessing, the noted photographer of the Louvre and the Vatican Museums, with spectacular results. "The exhibit showcases 34 life-size photographic reproductions of Michelangelo's ceiling frescoes, exhibited on 16-foot panels brilliantly illuminated, with outstanding resolution, clarity and color. It will also feature a 40 x 41 foot rendition of The Last Judgment. A short biographical film will show the genius and complexity of Michelangelo's life," Biallas said. The Sistine Chapel Exhibit first opened in Montreal in July 2015 to rave reviews and is currently on display in Vienna. During the State Fair, the exhibition will run every day from 10 am to 7 pm in the Women's Museum building, and is expected to achieve record-breaking attendance numbers, with more than 150,000 art lovers, families, and students. Fair attendees will be able to purchase tickets for the exhibit in advance and at the door for a nominal entrance fee of $8, with children 6 and under free. Tickets go on sale today at www.chapelsistine.com.